We need to talk about the Empire. I've been doing a good job putting out Rebel units, but there's a whole 'nother group out there just begging to be talked about. So let's start with the "Wave 0" Commander, the biggest, baddest thing on the battlefield - Darth Vader! Little Ani is a powerhouse, and there is a strong incentive to build him out like one. 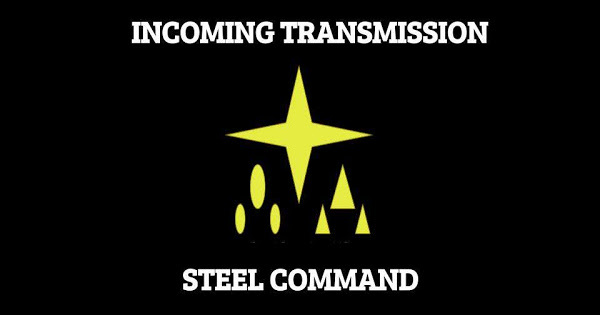 As a commander, he is going to be a central piece in your plans, and with 200 points just to field him with no upgrades, he's a whopping 1/4 of your list all by himself. Offensively, Vader is a powerhouse, assuming he can get himself into melee range. 6 Red dice for melee, along with Impact 3 and Pierce 3 means that he will annihilate anything that he closes with. Between an average of 4.5 damage per attack, and Pierce 3, it will be rare when he doesn't mulch at least 3 Troopers if he makes it into their midst. Relentless, in addition, allows him to move and then attack as a free action. This works with Saber Throw as well (which we will cover later) letting him chuck half his melee dice at something after movement. Note: Impact 3 and Pierce 3 will apply to the Saber Throw as well. Defensively, he's a beast to bring down as well. A red defense die means your opponent only gets a 50% chance to hurt him even if they do roll a hit. Deflect makes this even worse for your opponent - if he has a dodge token, he can use it as normal to cancel a hit, and convert all his surges into blocks as well (67% chance to block damage). In addition, in range attacks, you get to send the shots right back! 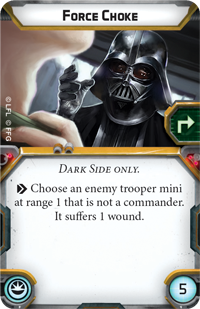 1 wound each for every surge rolled (and no save for whatever shot you) This makes focusing on Vader a scary proposition. We're not even done with defense. He's immune to Pierce, which is important when getting into Lightsaber duels with his son. 8 Health means that he's able to hang around even if some hits start piling in. His courage is a null value. This is a double edged sword, as you'll never gain suppression tokens and thus never gain bonus cover from taking fire. However, you cannot be panicked and units at Range 1-3 of you cannot be panicked either! This alone makes him a great Trooper commander, and if you can get him to the middle of the battlefield, you can ensure that pretty much every Trooper is covered by his Courage. 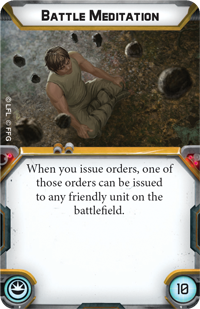 He also has the chance to equip up to 3 Force upgrade cards, and Master of the Force 1 lets him refresh one automatically at the end of each round. But he is slow. Very, very slow. Speed 1 to try and get him into the fight. 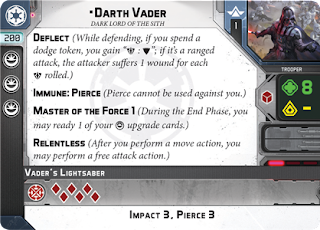 All you've got to make Vader better are Force upgrade cards, but he can take 3. Don't forget Master of the Force 1 when considering refreshable upgrades. Battle Meditation - 10 points - Not going with Troopers, who want to hang around Vader? Want to issue orders to an AT-ST or a pair of Speeder Bike units cruising up the flank? Battle Meditation lets you do this without worrying about putting comms on everyone (or putting jammers on them instead). Force Reflexes - 15 points - A free action to gain a dodge token, with an exhaust. 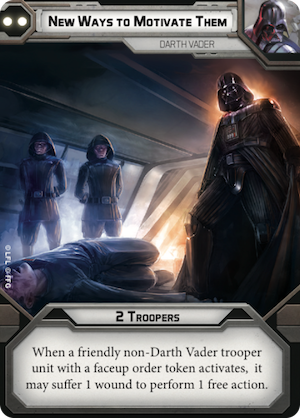 This is much, much better for Vader than it is for Luke, as Vader can refresh it each turn, ensuring Vader will always be ready to Deflect shots back to whoever is attacking him. 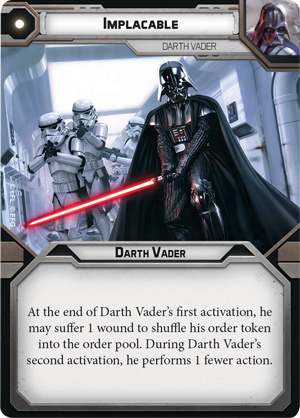 This will motivate you to have Vader go earlier in each turn though, as he won't be able to use a Dodge token if he hasn't activated to give it to himself. Force Choke - 5 points - A free action to just straight up end a trooper. Note: This says "choose an enemy trooper mini" not an enemy trooper unit. Point at heavy weapons, and end them. Choose specific minis to maximize your other unit's fire, or force a unit leader that is hanging back to be replaced closer to you, so Vader can get into melee range. It is an exhaust, but Vader doesn't care, unless you've got a LOT of exhausts. 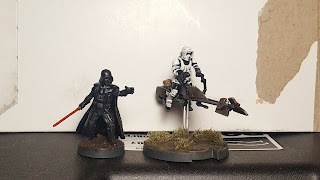 Force Push - 10 points - Another free action / exhaust. Perform a Speed 1 move with a unit, and you're most likely to use Force Push to pull them to you (and Lightsaber range) instead of shoving them away. Again, you aren't likely to care about the exhaust unless you're dealing with a lot of exhausts. 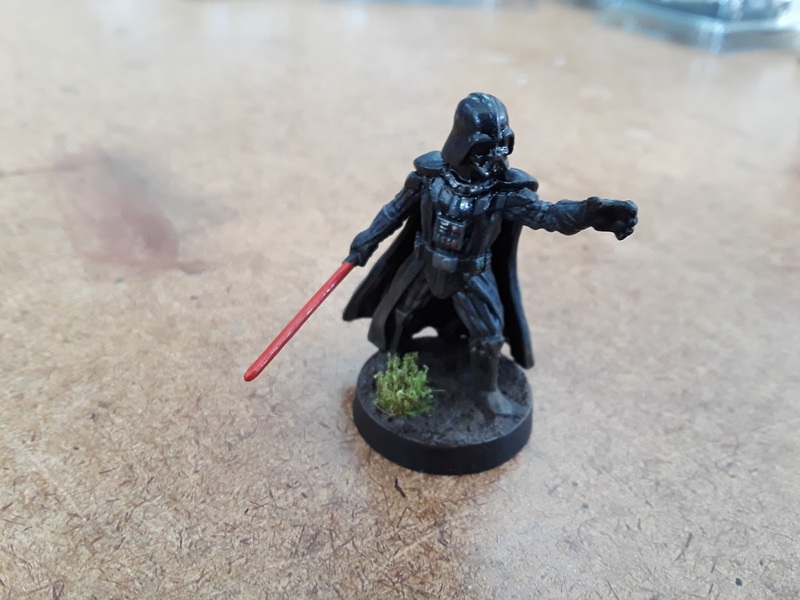 Saber Throw - 10 points - Give Vader a ranged attack! 3 Red dice at Range 1-2 with Impact 3 and Pierce 3 is very, very good, when you consider that otherwise you won't have any ranged attacks. This works with Relentless (it is an attack action) so you can move and then chuck your Lightsaber at something. This card is all about maximizing your Vader activation to wreck something's face, by giving you a Vader command, and a second Vader activation (with just one action) later in the turn. If your Vader has been built out as a Murder Beast, this is going to let him get two attacks in over the course of a single turn, though it won't let you mash something into a pulp quite like Son of Skywalker. 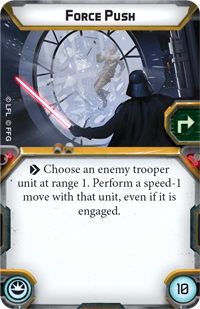 If using multiple commanders, pick this if your Vader is going to run into the middle of the action, and cut down his enemies. Vader wants to get the most out of your Stormtroopers, and doesn't understand why they would willingly hide behind cover when there are things to be done! You can do a wound to a trooper unit to give it an extra action. Rush your troopers forward with 3 moves right out of the gate! Aim and Fire even though you are under suppression. Press forward and claim those objectives! Note that as this is issued to Troopers, you can issue an order to Darth Vader himself with this command, but he won't gain the benefit of the ability. You can issue an order to Veers, if he's hanging around, to give him a free action though. This is the card that can make or break your mid / late game push. 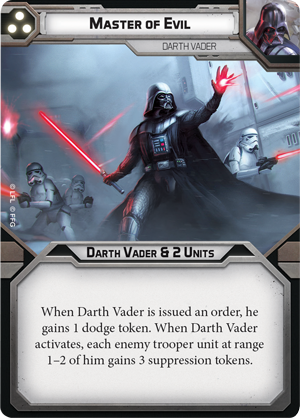 Using this card gives Vader a Dodge token, activating Deflect even if you want him to go late in the round. When you do activate him, early or late, you'll pile on 3 suppression tokens onto every trooper in Range 1-2 of him. This is enough to suppress anyone else so far, except for another Vader and should be enough to panic anything that isn't in range of a friendly commander. A well placed Vader and a well timed Master of Evil can scare nearly anything off of your objective tokens, and is great to be used offensively or defensively. The only drawback is that it is 3 Pips. 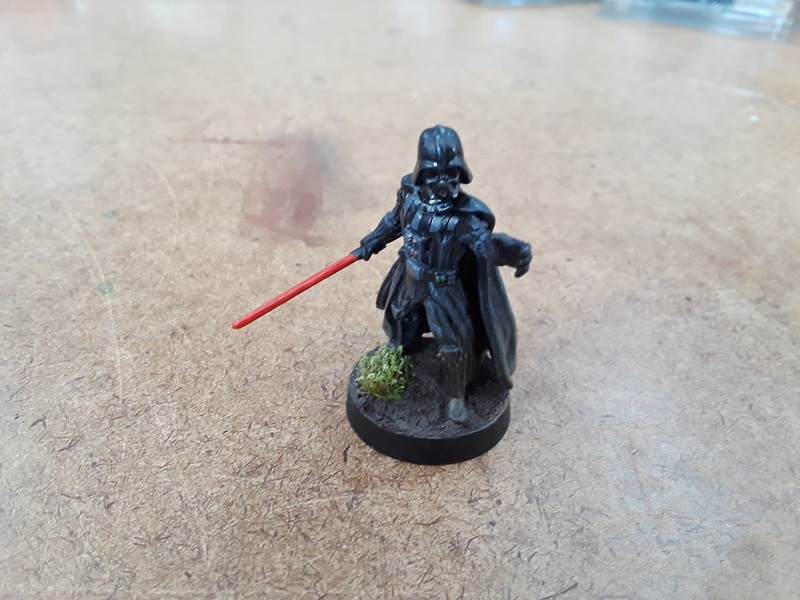 Want to get a Darth Vader like Chris's? Here's what he used to get the look: Note some of the paints might be older names for the colors. Don't forget to prime your models! Vader - Eshin Grey, Steel Legion Drab, Stirland Battlemire, Warboss Green, Leadbelcher, Bloodletter. ... then you put them on the model? I can never seem to get a good description of what exactly to do. But at least you have the color palette.